This column will be used for Quick Links to other pages of information - and to give help as you navigate through the website..
1. You may use the content solely for your own private study, research, and instructional or educational purposes, either as printed copies or by downloading on to your personal computer. 2. The licence granted to you to reproduce content permits the incorporation of material from the web site, with due acknowledgement of the copyright holder and Bramham Parish Council, into any non-commercial, personal research, instructional or presentational compilation for private or educational use, whether in hard copy or electronic or any other form. This includes use on an educational intranet restricted to non- commercial users. 1. Without the written permission of the relevant copyright holder, no part of these web pages may be published in any medium or transmitted to, or stored in, any publicly accessible website or other form of electronic retrieval system, nor accessed in such a manner as to make them appear part of any third party's web site or electronic database or retrieval system. 2. The names, marks and logos identifying Bramham Parish Council, and the proprietary names, marks and logos of third parties are copyright of these organisations and may not be reproduced without their prior written permission. Hyperlinking to Bramham Parish Council websites: You do not have to ask permission to link directly to pages hosted on this site. We do not object to your linking directly to the information that is hosted on our site. However, we do not permit our pages to be loaded into frames on your site. Bramham Parish Council pages must load into the user's entire window. Hyperlinking from Bramham Parish Council websites: We are not responsible for the content or reliability of any linked websites. Listing should not be taken as endorsement of any kind. We cannot guarantee that these links will work all of the time and we have no control over the availability of linked pages. We make every effort to check and test material at all stages of production. It is always wise for you to run an anti-virus program on all material downloaded from the Internet. We cannot accept any responsibility for any loss, disruption or damage to your data or your computer system which may occur whilst using material downloaded from this website. Whenever you visit our web site, our host server automatically records each page you visit and the IP address from which you are connecting to us. It also records other information, including your operating system, your web browser, and the web site from which you followed a link to this website (if any). Additionally, the Google Analytics reporting system may be active. This information is only gathered to establish general usage trends for the site, not to find out information about individual users. The content of this web site is provided for information purposes only. 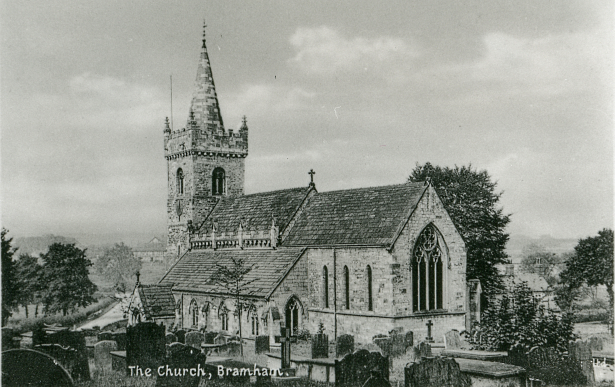 Whilst every care has been taken in its preparation, the Bramham Parish Council website and material relating to third party information, products and services, is provided 'as is', without any representation or endorsement made and without warranty of any kind whether express or implied, including but not limited to the implied warranties of accuracy, reliability, satisfactory quality, fitness for a particular purpose, non-infringement, compatibility, security and accuracy. Site visitors who rely on this information do so at their own risk. The collective content of this website (text, graphics, artwork, audio, video, images and the compilation of information) is protected by copyright laws in relation to the Copyright, Designs and Patents Act 1988 as amended and is copyright of Bramham Parish Council. Every effort has been made to locate copyright holders of material included on this website in order to obtain their permission to publish it. However, if any visitor considers material to be their copyright, the Council apologises for any possible infringement and suggests you email the clerk@bramhamparishcouncil.org.uk with details together with any supporting documents. You may use the material on this web site for your own private study, non-commercial research, and instructional or educational purposes under a Fair Sharing scenario. You must obtain permission from Bramham Parish Council republish the material on a public web site or within a work for publication in any medium. Such use may be subject to reproduction fees and the source of the material and its copyright status must be acknowledged. By its nature, this web site contains a large amount of personal information. It is our prime concern to ensure that we operate within the confines of the Data Protection Act. If you feel any of the data on this site causes or is likely to cause substantial damage or distress to you or any other living person, please contact us at clerk@bramhamparishcouncil.org.uk with specific details. If you choose to supply your e-mail address along with your other personal details, this will only be used to contact you about matters specific to this website. It will not be supplied to third parties and is not displayed on the site. We do not warrant that the functionality of this site will be uninterrupted or error free, that defects will be corrected, or that this site or the server that makes it available are free of viruses or represent the full functionality, accuracy, reliability of the materials. In no event will we be liable for any loss or damage including, without limitation, indirect or consequential loss or damage, or any loss or damages whatsoever arising from use or loss of use of, data or profits, arising out of or in connection with the use of the Bramham Parish Council website. Bramham Parish Council reserves the right to change any part of this agreement without notice and your use of the Website will be deemed as acceptance of this agreement. The changes will only be effective in regard of future use and will not effect users of the previous agreement. Bramham Parish Council have complete discretion to modify or remove any part of this website without warning or liability arising from such action. Bramham Parish Council is not responsible for the contents or reliability of the linked web sites and does not necessarily endorse the views expressed within them. Listing should not be taken as endorsement of any kind. We cannot guarantee that these links will work all of the time and we have no control over the availability of the linked pages. Bramham Parish Council does not necessarily endorse the views of those people submitting material for publication on the website. 1. Bramham Parish Council is under no obligation to publish any text, photos, documents, plans, maps, audio and video files submitted for publication to the site or for inclusion in the physical archive. 2. The editors may alter the text of material accepted for publication for the sake of clarity, without the author being notified. 3. Digital versions of images submitted with the story may need to be cropped by the editors to facilitate the creation of thumbnails. This cropping will be done with sensitivity to the subject of the image. 4. Bramham Parish Council reserves the right to reject material on the grounds of copyright infringement, offensiveness or other legal considerations. 6. All items submitted for consideration for publication on the website must be accompanied by a signed Copyright Release Form (available on this website). Any material submitted that Bramham Parish Council considers to be fraudulently obtained will be rejected. Unauthorised attempts to deny service, upload information, change information, or to attempt to access non-public data from this service are strictly prohibited and may be punishable to the full extent of the laws of England and Wales. These Terms and Conditions shall be governed by and construed in accordance with the laws of England and Wales. Any dispute arising under these Terms and Conditions shall be subject to the exclusive jurisdiction of the courts of England and Wales. Please note that the site guidelines on copyright or data protection issues do not constitute legal advice.